Urban Archeologist: Update To "Tray Bizzarre" Post! If this is your first visit, please start by reading the previous post, click here. Some of the friendly readers of one of my favorite sites: Bits & Pieces were kind enough to take a look at the odd trays I presented in the last post. One of them -Scott - found the answers to all the questions I posed. The trays themselves are likely "Tip Trays" just like the one offered for sale here. I sure would like to find this book and read it some day. 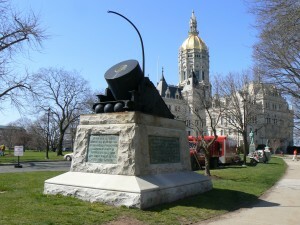 The tray with the heavy artillery piece from Hartford CT (Which I so grievously called a "cannon" and reader Don so politely corrected me that it was in fact a mortar) is a living breathing monument in Hartford! Thanks again to Don, DJ, and especially Scott, the comment-ors, the curious, and the down-right ingenious for helping me wrap this mystery up! The 'Introductory' (http://www.archive.org/stream/aroundunitedstat00murp#page/n13/mode/2up/search/tray) explains the tray and the tray is shown on a page between pages 16 and 17 (http://www.archive.org/stream/aroundunitedstat00murp#page/n23/mode/2up). I was more interested in the Lusitania tray but found nothing. I'm actually reading the book. It's not extremely well-written, but I'm really enjoying it. I think you've got an interesting souvenir from one heck of a 13,000 mile bicycle trip. I'm considering publishing a story about this journey. I'll be looking for any original photos or illustrations. If anyone has any leads, please get in touch. Thanks.